Latest Windows 10 Redstone 3 Preview Is Bringing Back "My People"
Microsoft has today pushed a new preview build for both PC and mobile users. Windows 10 Redstone 3 Preview Build 16184 is available for Insiders in the PC Fast ring, while Build 15208 brings some fixes and improvements to those on mobile. Along with other features and improvements, Microsoft is bringing back the “My People” feature that was first showcased during the development of Windows 10 Creators Update. 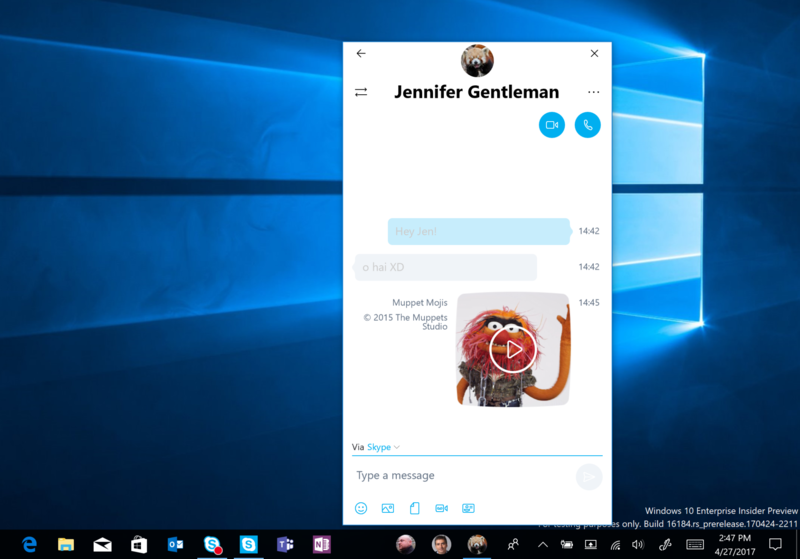 The Redmond software maker was expected to bring the ability to pin favorite contacts right to the desktop with the Creators Update, released to the public earlier this month. However, the feature was delayed possibly after the hype it created among the Insider community. Since Windows 10 Redstone 3 is expected to be a bigger feature upgrade, the company has been planning all the major and popular features for Redstone 3. Windows 10 Redstone 3 is set to roll out later this year in September. For those who missed this feature during the Creators Update development process, Windows 10 “My People” feature allows users to pin contacts to the taskbar, making it easier for them to access conversations. Here’s what else is included, changed or fixed in Windows 10 Redstone 3 Preview Build 16184. Note: Contact syncing is enabled by default following system settings in versions 11.13+ of Skype. If you have an older version of Skype you will need to manually enable contact syncing via the Skype app settings. Have feedback you want to share with the team? We want to hear it! You can send us feedback by tapping the ellipsis in the People flyout and selecting “Send feedback”, or by opening the Feedback Hub and sharing your thoughts in the Desktop Environment > My People section. We have some more work on its way for this that will soon be lighting up for Insiders, including our improved Share story for People, so stay tuned! New experience for Gmail accounts in Windows 10 Mail & Calendar apps: Last week, we announced we’re introducing a new experience for Gmail accounts in the Windows 10 Mail and Calendar apps that brings our latest features such as Focused Inbox and richer experiences for travel reservations and package deliveries that were previously only available to those with an Outlook.com or Office 365 email address. Windows Insiders will be the first to try out the new experience as the roll-out gradually happens over the next few weeks. You’ll know the new experience is available for your account when you are prompted to update your Gmail account settings. ADDED: PC Reset via Settings > Update & security > Recovery will not work on this build. Some Insiders have reported seeing this error “Some updates were cancelled. We’ll keep trying in case new updates become available.” in Windows Update. See this forum post for more details. The “Save” dialog appears to be broken in several desktop (Win32) apps. The team is investigating. This will break things such as Chinese IME, etc. Localized apps on localized x64 Windows 10 Insider Preview builds will not work. We’ve heard some reports that the Action Center isn’t opening as reliably in recent builds, and are investigating. For more details, visit the announcement post. Remember That Power Slider Microsoft Had Promised Will “Eek Out Every Ounce of Performance”? It’s Back!